Breast Cancer Awareness Month started with some wonderful events. 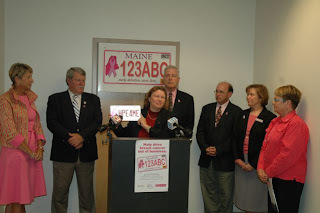 First, was the launch of the new Maine Breast Cancer License Plates. Representative Meredith Strang Burgess sponsored the enabling legislation for this effort and was the leading torchbearer through the last two years’ of complicated legislative and motor vehicles process. I asked my children a few weeks ago what they wanted on our license plate. Because their childcare provider, Barbara, had passed away nearly two years ago from breast cancer, they had followed the legislative process enabling these plates, and this became a personal cause for them. They felt strongly the word “hope” should be on the plate, in honor of Barbara, who worked hard to instill hope in the children, even as she was dying. Rep Burgess searched for letter combinations available with the word “hope” in them, and found “HPE4ME”, which she felt appropriate because it stands for “Hope for Maine”, with the rest of the plate having a map of Maine and the breast cancer ribbon on it. So, Wednesday morning Secretary of State Matt Dunlap, Representative Meredith Strang Burgess, Senator Dennis Damon (chair of the Transportation Committee), and representatives from the three benefiting organizations from the sales of the plate – Maine Cancer Foundation, Maine Breast Cancer Coalition, and Maine Breast and Cervical Health Program (within the Maine CDC) – gathered at the Bureau of Motor Vehicles (BMV) to launch the new plates. This was an exciting moment, since, as Rep Burgess commented, “this is the only license plate that will save lives!”. It is hoped that about $40,000 - $50,000 will be raised annually from the sales of the vanity plates. Link to the BMV website http://www10.informe.org/bmv/vanity/) or go to a local BMV office to order your breast cancer plate, which is $20 for a specialty plate, $25 for a vanity plate, and $2 for the online agent fee. There is also a no-cost step women can take to help prevent breast cancer. The famed breast cancer physician, Dr. Susan Love, has teamed up with researchers to start a movement called “Army of Women”. This initiative offers a new way for every woman to partner with research scientists by signing up to indicate possible interests in participating in research to find the causes of breast cancer. You can sign up even if you have no history or family history of breast cancer. Sign up by linking to Army of Women at http://www.armyofwomen.org/. After the launch of the license plates, I attended the Maine Cancer Foundation’s Cure Breast Cancer For ME luncheon. Inspired by the stories shared around the table I was sitting at as well as the many presented on stage, I have rarely cried and laughed so hard in one 2 ½ hour period! Filled with over 500 who have gathered to raise money for the Maine Women’s Cancer Fund, the luncheon has become a stellar event of celebration and inspiration. I was fortunate to sit next to a young woman who has recently finished chemotherapy for breast cancer. When I found out she has three young children, I asked how she had coped the last several months. She replied, “it’s because of her”, pointing to Eileen Skinner, the CEO of Mercy Hospital, sitting on the other side of me. She went on to explain that her husband works at Mercy, and he was told to take the time he needed to be with his wife and children. It seems that all of us can do something to help someone with cancer. If you know someone with breast cancer or another type of cancer and you’re not sure how you can help them, or you yourself have cancer, the American Cancer Society’s “I Can Cope” website is a great resource for providing such tools (http://www.cancer.org/docroot/ESN/content/ESN_3_1X_I_Can_Cope_Online.asp.) and the Massachusetts General Hospital also has such tools (http://www.massgeneral.org/cancer/crr/topics/help/index.asp). Throughout Wednesday I was inspired by so many cancer survivors I was privileged to meet. I also couldn’t help but think about the many different strides we have made the past 40 years. When my Aunt Elizabeth died in the early 1970s of breast cancer, we hardly uttered the word “cancer”, and much less “breast cancer” to describe the disease that took her life. Now, we have an opportunity to proclaim our desires to prevent and cure breast cancer on our car license plates!